Organic Wheat Free Tamari is certified by Quality Assurance International (QAI). Organic Tamari is made with 100% soybeans and no wheat. It is naturally fermented for up to 6 months. We add no MSG or artificial preservatives. Organic Wheat Free Tamari's fermentation process is different than ordinary soy sauce, giving it unique flavor enhancing properties. Add Tamari to gravies, sauces and casseroles. Use it as a marinade and in stir-fry dishes. Reduce sodium levels in your cooking without compromising taste. One teaspoon of Organic Tamari contains one-eighth the sodium as one teaspoon of salt. Certified gluten free by the Gluten-Free Certification Organization. Kosher . Vegan. Non-GMO. Organic. 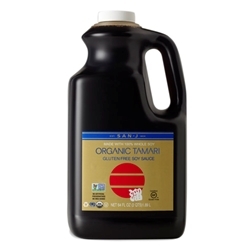 San J Tamari Organic Sauce, 1/5 gal.